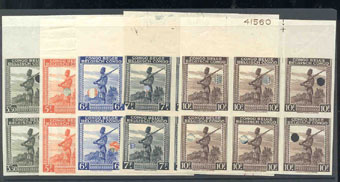 11951 EP BELGIAN CONGO (1942) Native soldier*. Set of five imperforate margin blocks of six with control punches. Several have printer's marks showing minor flaws. Scott Nos 201-5, Yvert Nos 262-6. Magnificent exhibition item and difficult to find!